Silver peaked just shy of $50 during April of 2011. The price has been correcting ever since, falling below $14 per ounce in 2016 and again late last year. But there is a silver lining to such a deep and protracted price correction. With silver prices under $20 per ounce for so long, a significant number of mines are unable turn a profit. And even the ones that can, are not generating enough cash flow for the mining companies to spend significantly on mine expansion or exploration drilling. Silver is often mined as a by-product of other metals, but prices have been down across most precious and base metals over the past 7 years. Declining revenues and lack of earnings, make it difficult to raise capital or contemplate putting new mines into production. Several silver companies had to their mines on ‘care and maintenance’ or totally shelf plans to build mines that were once deemed economic. The result is that silver mine output and overall production drops. There is a lag effect, as many miners will continue to produce in order to generate revenue, even if they are making little to no profit. But eventually, they are forced to close unprofitable mines and their project pipeline becomes small or non-existent. Making matters worse, scrap silver supply levels have also been declining sharply in recent years. Scrap silver supply went from 260 million ounces in 2011 to just 138 million ounces in 2017. This has been the state of the silver market lately, with the lowest levels of output since 2013. Economics 101 teaches that lower supply is a component of higher prices. But the concurrent impact of lower demand has capped any potential prices advances in recent years. That could all be changing now, as silver has become increasingly attractive to investors looking for undervalued asset classes or safe-haven investments. Silver is benefiting from the persistent trade war, government shutdown, weakening dollar and a more dovish Federal Reserve. The FED held rates steady at the FOMC meeting yesterday and stressed that they will be patient with future rate hikes. They also suggested that the FED balance sheet may not shrink much further. Some analysts even anticipate that the central bank will need to reverse course and reduce rates at some point in the near future, should the stock market correction resume. But the precious metals market does not need a reversal of course, just signs that the hiking is slowing or near an end. This turning point is enough to ignite a new bull market in gold and silver. 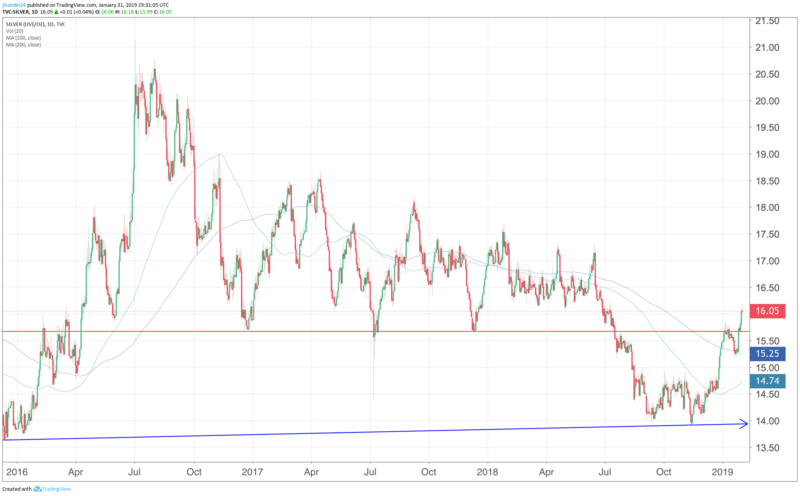 We are seeing early signs of a rebound in silver demand, which could have an acute impact on prices, given the multi-year lows in production. And silver demand has once again exceeded supply, creating a silver deficit for 6 straight years. This deficit hasn’t been enough to boost prices in recent years, as the silver price has followed gold lower. But the accumulative effect is likely to generate a significant spike in the silver price this year. In fact, we are forecasting that the silver price will climb back above $20 per ounce during 2019 and challenge all-time highs around $50 per ounce by 2021. The price chart shows the significance of the recent breakout, as silver has climbed through prior support that turned to resistance. It has also climbed through both the 100-day and 200-day moving averages. It is also worth noting that the 2018 low in silver was a higher low versus the 2016 bottom. Higher lows on the chart are bullish for prices. 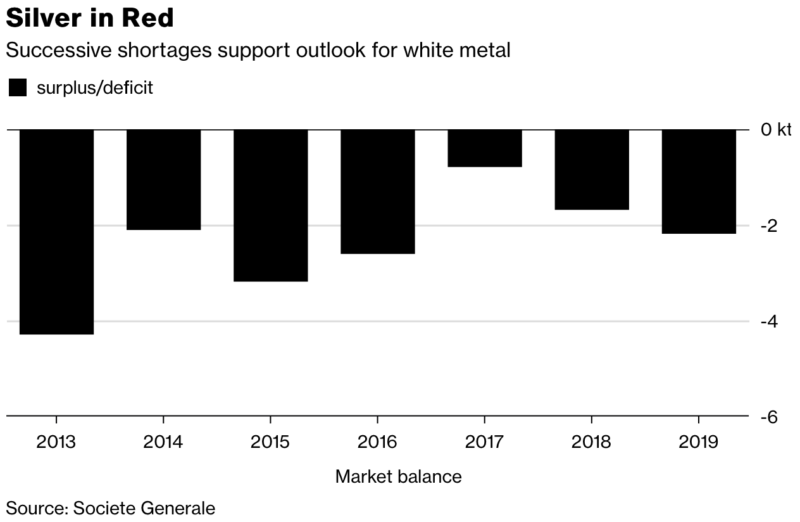 The downside risk for silver is that slowing economic growth could dent industrial demand, which accounts for roughly 50% of overall silver demand. However, the silver price tends to follow or even lead gold higher when safe-haven demand increases. And with supply declining and signs of physical bullion demand returning, any negative impact from slowing global growth should be muted. So, what is the best way to profit from this coming move in silver? We advocate holding some physical silver in your possession as insurance and a crisis hedge. But silver mining stocks are offering significant leverage to the move in the silver price and we expect this trend to accelerate in the months ahead. While the silver price is up 3.7% in the past month, the Silver Miners ETF (SIL) is up 8.2%. Our latest silver stock pick is up 23.9% in the same time period. So, while you can do well owning silver or SIL, we believe that far better returns can be achieved by selecting a basket of quality mining stocks with near-term price catalysts. Sign up for a premium membership to get all of our top stock picks, trade alerts, newsletter and more! Jason Hamlin is the founder of Gold Stock Bull and publishes a highly-rated investment newsletter focused on strategies for profiting in the bull markets in gold, silver, energy, agriculture and emerging technologies. Mr. Hamlin has a background analyzing charts and trends for the world’s largest market research company, is versed in fundamental and technical analysis and has consulted to Fortune 500 companies around the globe. Jason is a cycles investor, student of Austrian economics and speaks regularly at investment conferences throughout North America. The Gold Stock Bull newsletter is focused on finding junior mining companies that are undervalued relative to their peers. His website is at www.goldstockbull.com .